hahahha mga taga CVG na maangas. Hahahaha... Convergys Glorietta 5, 8k per pay day, gnyan sila sa Makati, tga Taguig ako, lilipat na ako sa chase. hindi po mayayabang ang mga taga CVG.. baka insecure lang kayo hahahaha..
Kaya pala nakaka 13k to 14k aq every cut off ..haha depend sa tenurity and experience ung basic ng cvg ...halatang baguhan ka sa bpo kaya binarat offer sau .. Thanks for the info. We have added CGI (Logica) on the list. We have also added PLDT the parent company of SPI Global. Haha, it's funny that Genpact Services LLC is not in this list but the company has always claimed being in the top. The company really doesn't deserve to be anywhere close to this and this article is the proof. "in the top".. are you for real? ?..undergrad ka siguro?..sana tinagalog mo na lang..tsk tsk.. But GENPACT is number one for handling financial accounts, and collections here in the phils. 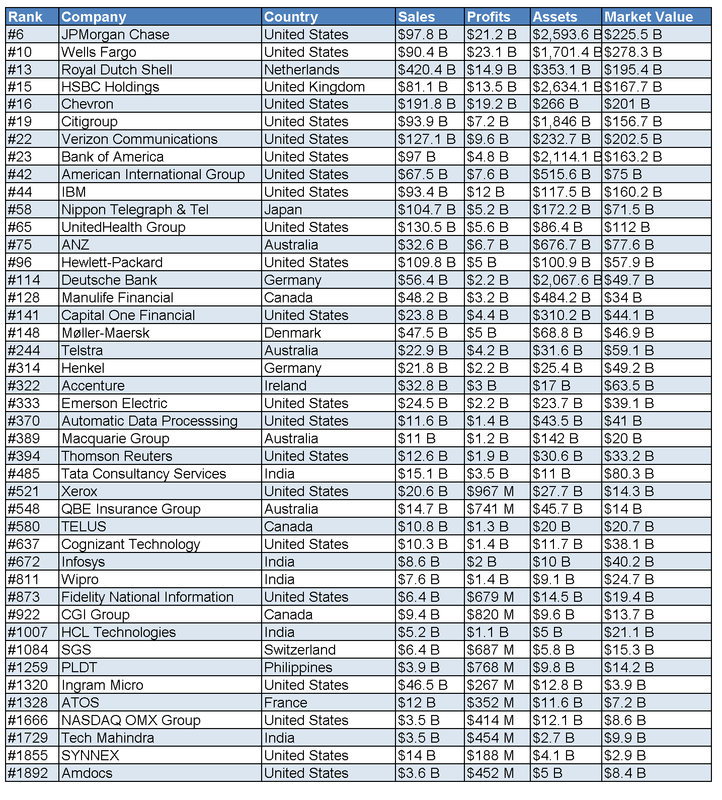 This is the list of the World Biggest Public Companies which happens to have a BPO. The title of this article is misleading. These are TOP BPO Companies based on Sales, Profit, Assets and Market Value but would these numbers matter to an employee? For me what matters most is the Employees' Satisfaction which is basically based on how their company treat them no matter how profitable they are or not. Being on the top rank on this kind of data doesnt mean they have the most satisfied employees. It's the "company" that made it to the list and it can stay there with or without you. Mga "pahinanteng" barya barya lang ang inuuwi. Mag negosyo ka para mas maganda pakinggan pag pag nag eeninglish "ur d boss" PAK MOWDELING 4 UR OWN ECONOMY! please add henkel. #314 on forbes list. Thanks for the input, we have updated the list. Convergys, TP, Teletech and other companies are publicly traded companies as well, being not on the list may mean that investors are doubting its stability.